Get your face smashed in — on the Army's #39 NASCAR Chevy! You are at:Home»Army»Get your face smashed in — on the Army's #39 NASCAR Chevy! Love NASCAR? 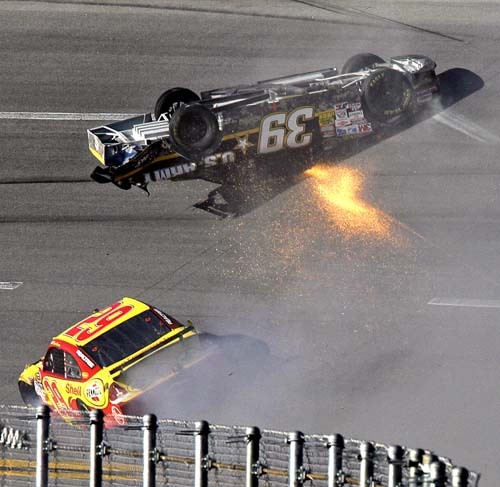 Love NASCAR crashes? Ever wanted to be part of one? Well now you’ve got a chance, if you’re a vet. The Army and Stewart-Haas Racing have announced a promotion for veterans to put their faces on Ryan Newman’s #39 Army-sponsored Chevy for the Kobalt Tools 500 Sprint Cup at Phoenix International Raceway on Nov. 14. That’s right, if you’re a veteran, you may be able to get your mug painted on the bumper of the #39 car — the same bumper that could put that weenie Jeff Gordon into the wall or get rear-ended by crazy man Carl Edwards. The deadline to submit your photos is Sept. 24. Go here to enter.